When the NEO Smart isn’t connected to a smartphone, tablet or computer, it behaves as a fluid trainer. This means the trainer behaves progressively: when your speed increases, the resistance increases as well. So it is possible to use this trainer in a “stand-alone” status. Furthermore, the Tacx NEO features Plug in/Plug out technology and can therefore be used with and without a plug. When the plug is not in use, the trainer will act as a wireless motor brake. This means the trainer will be not be able to speed up during descents. So you can use this trainer anytime and anywhere, even when you don’t have your smartphone with you. Suitable for: See suitable cassettes. Cassette not included. Not compatible with E-Thru axle 10mm and 12mm. The operating principle represents direct drive technology in its purest form. Any physical transmissions such as belts, rollers or wheels have been omitted in order to ensure optimum power efficiency, from the pedal to the motor. Thanks to an uninterrupted power flow, you won't lose a single bit of output or power. A virtual flywheel dynamically controls the brake force. This means that the resistance is calculated and adjusted continually to simulate natural road resistance. Whereas other trainers use a flywheel to pass the dead centre, the NEO uses calculations to predict the movements of the bike and simulate the action of a flywheel. The inclusion of FAST technology means the NEO carries out a 1000 calculations per second to predict the rider's movement. The virtual flywheel can generate a variable inertia effect, allowing it to simulate the bike movements of all cyclists up to a specific bodyweight (125 kg max.) in a highly accurate manner. When calculating the brake resistance required, all physical formulas a cyclist encounters on the road are applied to create a situation that is as realistic as possible. Air and rolling resistance, gradient percentage, weight, air pressure, wind speed, temperature, altitude, inertia and brake properties are all taken into account and calculated hundreds of times per second to achieve a realistic feel. LED light: The direct drive is equipped with an LED light, which changes colour in response to your power. If your power output is high, the light turns red. If you are cycling at a low power output, the light is blue. Cadence measurement: No cadence sensor is used to determine the cadence. As mentioned previously, the NEO performs a thousand measurements per second in order to predict the bike's movements. The sine modulation of the bike's movement is used to determine the cadence and the power output. 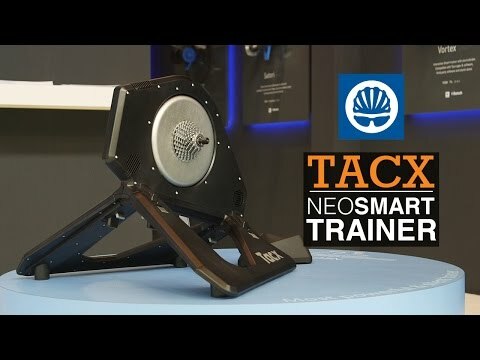 You may connect a Tacx Smart trainer to your smartphone, tablet or computer with ANT+ or Bluetooth® Smart in order to use our software and apps, or that of others. You may also use it stand-alone, without linking the trainer to a device. This means you are completely free to choose the software you want for your indoor cycling workout.